Location. Location. Location. Beautiful town-home in one of the best locations in the Charleston Area. This 2 bedroom, 1-½ baths Townhouse is located in the Old Village of Mount Pleasant. This Townhouse offers one queen size Rice Bed bed in the master bedroom as well as 2 queen size beds in the second bedroom. 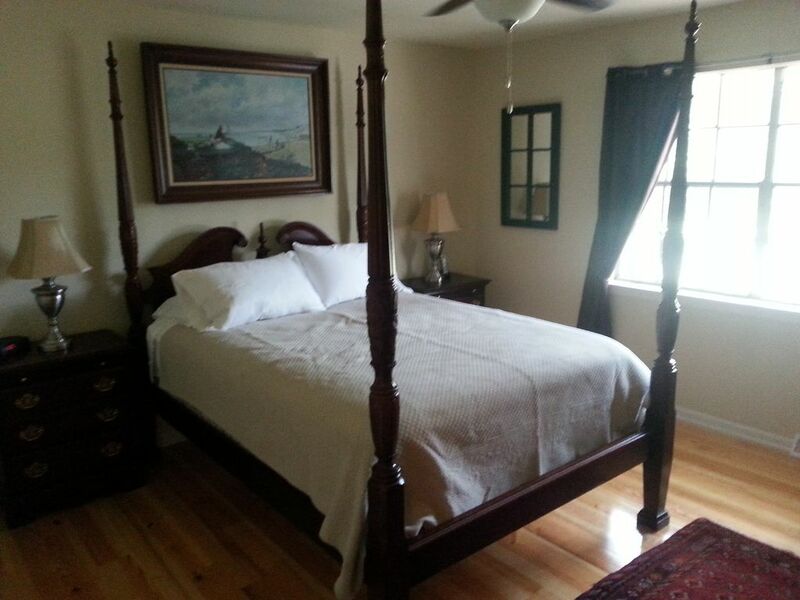 Both bedrooms are located on the second floor. This home has everything you need including cable, WiFi, and washer and dyer. This quite Town home overlooks a 2 acre courtyard. Located just off the corridor from Ravenel Bridge to Sullivan's Island. Close to downtown Charleston, Shem Creek, Pitt Street Bridge, Patriot's Point on the Charleston Harbor, & the beach on Sullivan's Island. Town home is on the last street before you cross over the Ben Sawyer Bridge to Sullivan's Island - it's only 2 miles to the beach(nice walk or bike ride). On the Island you will find: Station 30 - a well known kite boarding spot on the East Coast & fabulous places to eat: Home Team BBQ, High Thyme, Salt, & Poe's Tavern. Shem Creek is just 2 miles north of town home. Lots of places to eat such as Reds, R & B's, Water's Edge, Vickery's, and Shem Creek Bar & Grill. Watch the sunset and fishing boats come in for the day. Nature Kayak Adventures on Shem Creek offers kayak & paddle boarding tours and rentals. Walk or bike about 12 blocks to the Charleston Harbor to the Pitt Street Bridge (1000 foot pier) and take in breathtaking views of Sullivan's Island & Downtown Charleston. Enjoy fishing & crabbing off the pier. Places to eat: Village Bakery & Post House. You are only a 15 minute drive to Visitor Center in downtown Charleston and 5 minutes to Patriot's Point where you can visit the Yorktown, watch College of Charleston Soccer, Baseball, & Softball. There are five golf courses within 5 - 20 minutes of town home. Isle of Palms Beach is 10-15 minutes away. Charleston International Airport is 17 miles north of home. Bikes, golf carts, kayaks, boats are available to rent within minutes of property. Three grocery stores are within a fourth of mile from home. Lots of restaurants are located near the property, some within walking distance. TO RESERVE; 50% do now balance due 30 days prior to arrival. If you Rent within 30 days Rent plus deposit is due at time of reservation. All pets are subject to approval!! I live two blocks down the Street and I have a booth in the Charleston Market selling Tin Art. Located to everything the Lowcountry has to offer! THIS IS THE PERFECT SPOT FOR YOUR NEXT VACATION! Just minutes from the historic Harbor, downtown Charleston and the best beaches of Sullivan's Island and Isle of Palms! This open concept coastal townhome has 2 bedrooms 1 1/2 full bathrooms, and a well-equipped kitchen! This quiet unit has a great outdoor space for grilling and relaxing from the beach. The property is in wonderful proximity to GREAT historic landmarks (i.e.-Fort Sumter, Middleton Place, and Arthur Ravenel Bridge), the best beaches, shopping, fantastic restaurants and low country living at it's best!! Plenty of things to do or just relax on the beach. Nearby top golf courses, waterfront dining, kayaking, fishing/charters, waterfront pier, bird watching, boating activities! Come visit us today and see what all of the Lowcountry is about! View the available dates TODAY and Book on the calendar below while planning your paddleboard, bicycle tour, or carriage ride! Only to ground floor Bedrooms are upstairs.